Some say crafting a good App Store page is an art, but we say it’s a science. As marketers, there’s a lot you can do to improve your app page conversion rate (CVR) on the Apple App Store and Google Play. Designing the right creative assets, delivering the most relevant messages, and matching user expectations are crucial to mastering your App Store Optimization (ASO) strategy and can be accomplished through testing. Based on our analyses of over 500M app store user sessions, here are some best practices for creating a more optimized app store page. The First Impression Frame (everything above the fold) matters most. You have roughly 3 seconds to explain to visitors what your app does. In those few seconds, visitors will exhibit one of two behavior types. 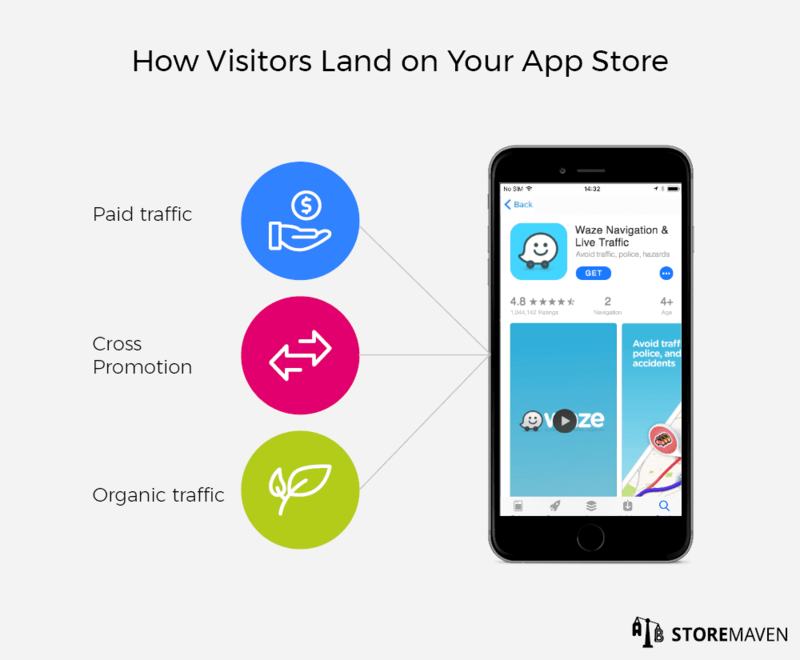 The key is to focus on optimizing the most dominant marketing assets in the First Impression Frame of each app store. On the Apple App Store, you should focus on optimizing the First Impression Gallery (Use this infographic to identify which assets are visible since it changes based on Gallery orientation). *Please note that Google is rolling out an updated App Listing design, which will affect the First Impression Frame in the Google Play Store. You can learn more about how this update will impact your ASO strategy here. It’s important to realize that what works on the Apple App Store does not necessarily work on Google Play—and vice versa. Why? The design of each app store page is different (e.g., no autoplay feature on Google Play videos, image resolutions are different, content in the First Impression Frame, tag bubbles underneath the App Title, etcetera). Developers often drive different traffic to each store (i.e., different sources, campaigns, and ad banners). Different apps are popular in each platform, so competition varies. User base for Google is not the same as iOS—their mindset and preferences are fundamentally different. For those reasons, it’s essential to avoid a “one size fits all” approach to app store marketing. In fact, we’ve found that using the same creatives on both platforms can actually lead to a 20%-30% decrease in installs on iOS. In the iOS App Store, the App Preview Video is on autoplay, which means that a majority of Product Page visitors are exposed to the video. The average video watch time among all app categories is only 4–6.5 seconds, so be sure to explain your app’s main value propositions in the first 3 seconds. In Google Play, the Video is not on autoplay, and only 6% of visitors actually play it. However, Google is expected to roll out a new Store Listing design in which the Feature Graphic will be removed entirely, and videos will be moved to the Gallery. The removal of the Feature Graphic will place more prominence on the Gallery in the First Impression Frame. StoreMaven tests show that the video watch rate increases significantly on the new Google Play design. Testing your Screenshots can increase CVR by up to 28%. In fact, our data shows that leading mobile publishers test their Screenshots at least once a month. One type of test we recommend is optimizing the orientation of your Gallery since it impacts what visitors see when they land on your page. On both stores you have the option of having a landscape, portrait, or hybrid gallery orientation. For a detailed explanation and visual guide, refer to this infographic. Each orientation comes with advantages and disadvantages. Landscape orientation allows you to focus on one key message while portrait orientation enables you to display multiple messages or unique selling propositions in the First Impression Frame. Testing is required to determine which orientation works best for your specific app and visitors. In addition to gallery orientation, you should also test the design strategy of your Screenshots. As with gallery orientation, you should test different design strategies to see which strategy has the highest impact on your CVR. 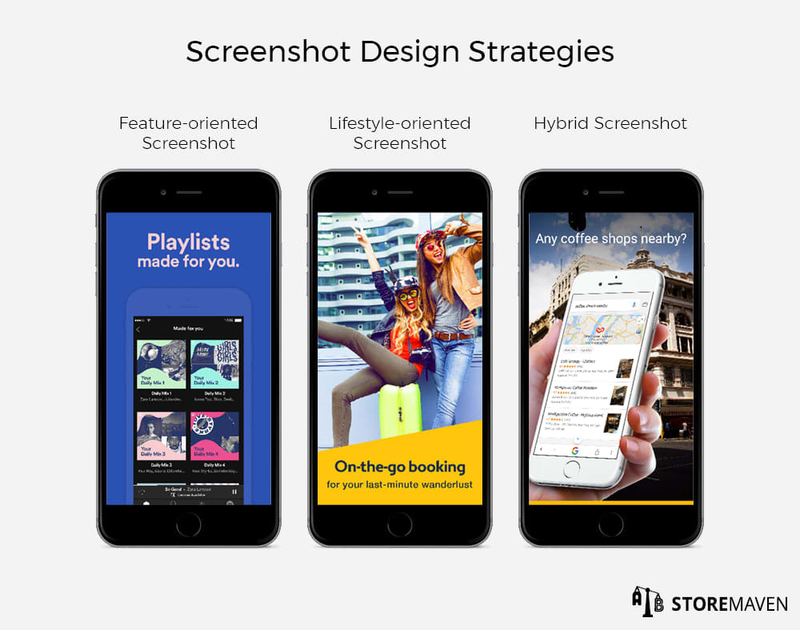 For more information on Screenshot design strategies read this, this, and this! Repetitive messaging harms exploration and conversion. If visitors see the same message twice, they’ll think that’s all there is to see and will immediately drop from your app store page without exploring further. Our data has shown that repetitive messaging can greatly influence instant drop rate across both the Apple App Store and Google Play. Show Decisive and Exploring Visitors unique messages and concepts that will encourage them to stay and install. With the update to App Analytics on iTunes Connect (now referred to as App Store Connect), you can now pinpoint which traffic sources are driving users to your Apple App Store Product Page. This enables you to identify the hidden potential of a certain traffic source and better optimize your marketing and UA campaigns. If you’re trying to optimize for Search traffic, CVR is influenced by your Video & Screenshot Gallery because these are the only assets that appear in the Search Results Page. Within the search page, the 1st three Screenshots/Videos are visible if in portrait orientation, and only the 1st asset in the Gallery (Screenshot or App Preview Video) is visible if in landscape orientation. If you’re trying to optimize for Browse traffic, CVR is influenced by your Icon since it’s the only visual item that appears when users browse through the iOS 11 App Store navigation tabs. 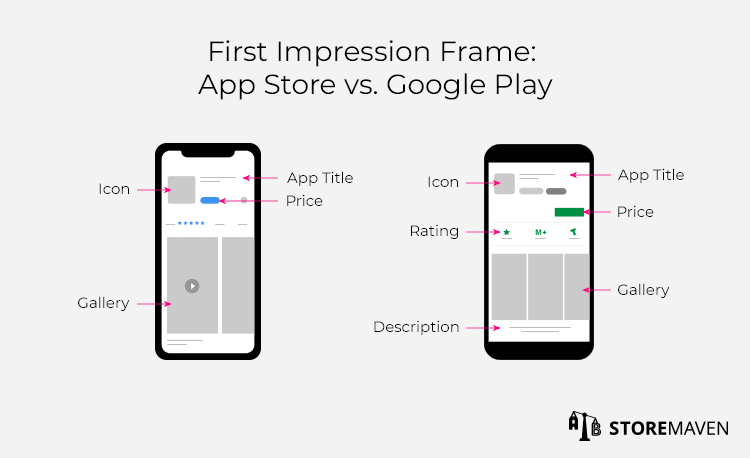 If you’re trying to optimize for Referral traffic, CVR is influenced by the First Impression Frame since all traffic that comes from app or web sources will land on your full App Store Product Page. To take advantage of these new analytics, you should monitor the impact of any new Product Page versions you push to the live store. If you’d like to learn how to use iTunes Connect to measure your ASO efforts, read the full guide. In the past, Google only allowed you to separate organic traffic (i.e., search and browse traffic) from paid traffic in your Play Console analysis. However, Google recently announced an update to the Play Console’s acquisition report that will enable you to isolate search from browse—essentially leveling the playing field with Apple. This is crucial for identifying your biggest growth opportunities and determining which channels to optimize. 8. Don’t Forget About Localization—It’s Your Lowest Hanging Fruit! What works in one country doesn’t necessarily work in another. 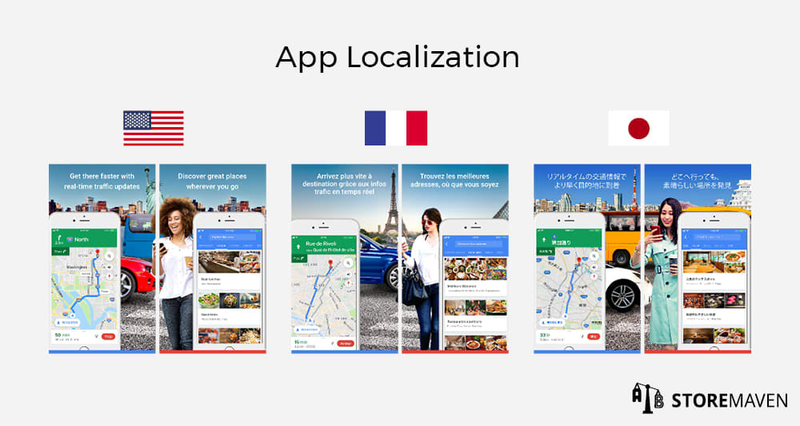 It’s important to be aware of language differences and effectively market your app in each regional store by translating to the local language. In the Google Maps example above, you can see localized app stores for the United States, France, and Japan. Notice how they use the same messaging, features, and design but in different languages, and with different models and cities. Localization is the process of adapting an app store to different countries and their languages. 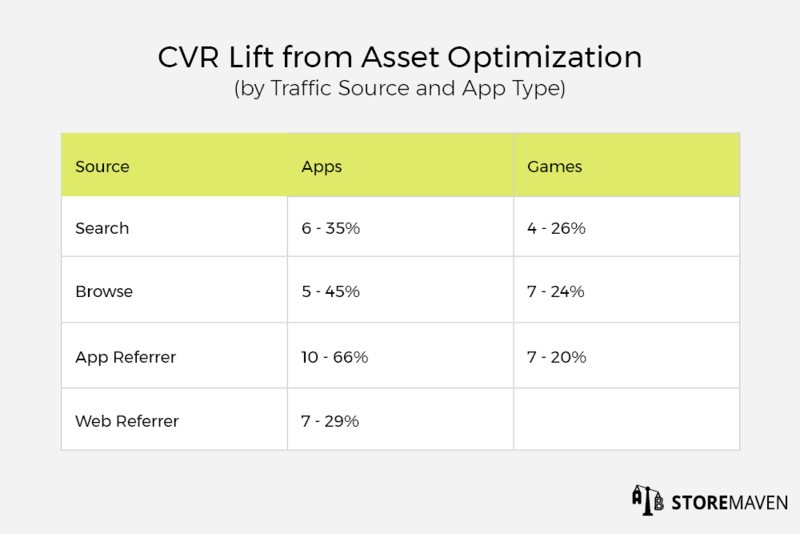 Our data shows that among the top gaming apps, the CVR lift gained by localizing app stores reached up to 26%. For best practices on localizing your app, read this. Localizing your app is important, but you shouldn’t stop there. It’s crucial that you also make culturally informed design choices so your app matches the preferences and culture of the regions you want to target. 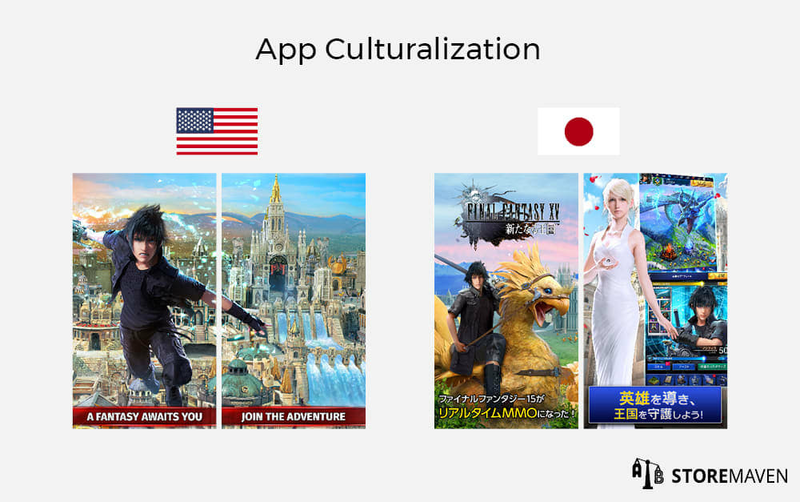 In the Final Fantasy example above, they showcase completely different elements in the United States store compared to the Japan store. Culturalization is the process of optimizing the messages you’re showing to different regions based on their unique values and behaviors. In almost all tests that had both a translated variation and a culturalized variation, the culturalized variation won. This goes to show that you can achieve a higher CVR lift by designing your store to fit a specific culture versus just a literal translation. For best practices on culturalizing your app, read this. The App Store and Google Play are dynamic. What works now might not work next month, which means you should be testing frequently in order to learn and evolve with the market. Now that you know our top 10 ASO tips, you’re ready to put them to the test! 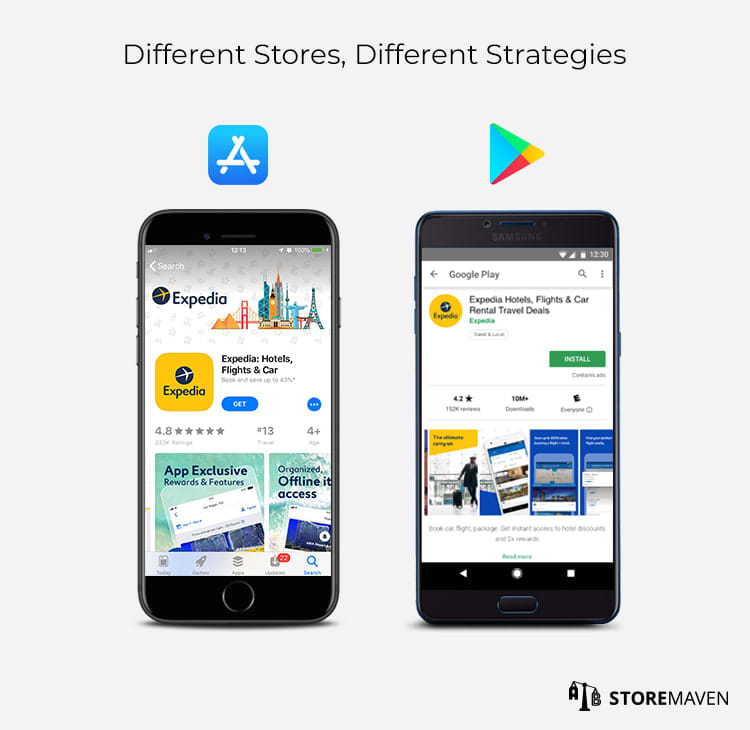 If you’d like to start optimizing your creatives or would like help building your ASO strategy, feel free to contact us at info@storemaven.com!